The ketogenic diet is one that is very low in carbohydrate, high in fat, with moderate protein. This diet shifts the body into a natural, healthy metabolic state known as nutritional ketosis. In ketosis the body uses fat as its primary source of energy instead of glucose. Some of this fat is converted into an alternative form of fuel called ketones. Ketones are high-potency fuel that boost energy and cellular efficiency and activates special enzymes that regulate cell survival, repair, and growth. When a person is in nutritional ketosis, blood levels of ketones are elevated to therapeutic levels. In response, high blood pressure drops, cholesterol levels improve, inflammation is reduced, blood sugar levels normalize, and overall health improves. Low-fat diets have been heavily promoted for the past several decades as the answer to obesity and chronic disease. However, we are fatter and sicker now more than ever before. Obviously, the low-fat approach has not worked. Our bodies actually need fat for optimal health and function more efficiently using fat for fuel. 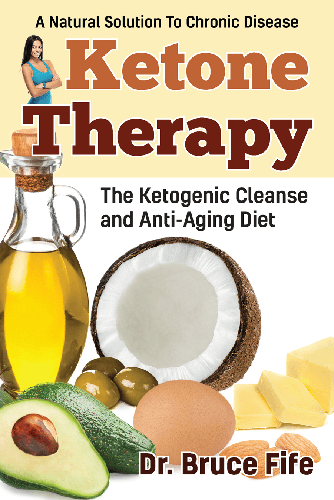 In this book, you will discover how people are successfully using the ketogenic diet to prevent and treat chronic and degenerative disease. Ketone therapy is backed by decades of medical and clinical research, and has been proven to be both safe and effective for the treatment of a variety of health issues, including the following: Alzheimers disease, Parkinsons disease, stroke, multiple sclerosis, heart disease, cancer, diabetes, obesity, metabolic syndrome, Crohns disease, ulcerative colitis, arthritis, irritable bowel syndrome, glaucoma, macular degeneration, migraine headaches, sleep disorders, and depression. It doesnt stop there. Research is continually discovering conditions that are responding to the ketogenic diet. Many health problems that medical science has deemed incurable or untreatable are being reversed. Medications that were once relied on daily are no longer necessary and are being tossed away. People are discovering that a simple, but revolutionary diet based on wholesome, natural foods and the most health-promoting fats is dramatically changing their lives. It could be the key to changing yours as well.